Fol Chen has joined forces with Monome and Machine Project to bring you the Tetrafol. Some of you already instinctually know what this is, because you've been waiting for it all your life. 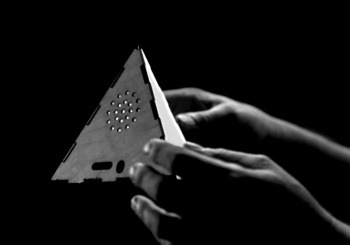 Others may need an explanation, so here goes: The Tetrafol is a hand-held tangible electronic sound toy. Circuits enclosed by a wooden tetrahedron detect orientation and motion-gestures to modify the playback of a collection of Fol Chen's micro-compositions. Users can explore sound through objectual physical manipulation. The battery-powered device has its own internal speaker but can additionally be hooked up to a headphone or amplifier for broader consumption and recording purposes. The circuit and firmware are based on open-source hardware and is itself published as open-source, allowing anyone interested to learn about its deepest inner-workings. There are only 100 of these devices. You can buy one for $110 right now by clicking here. For now. To get information about Fol Chen in your email, go here.